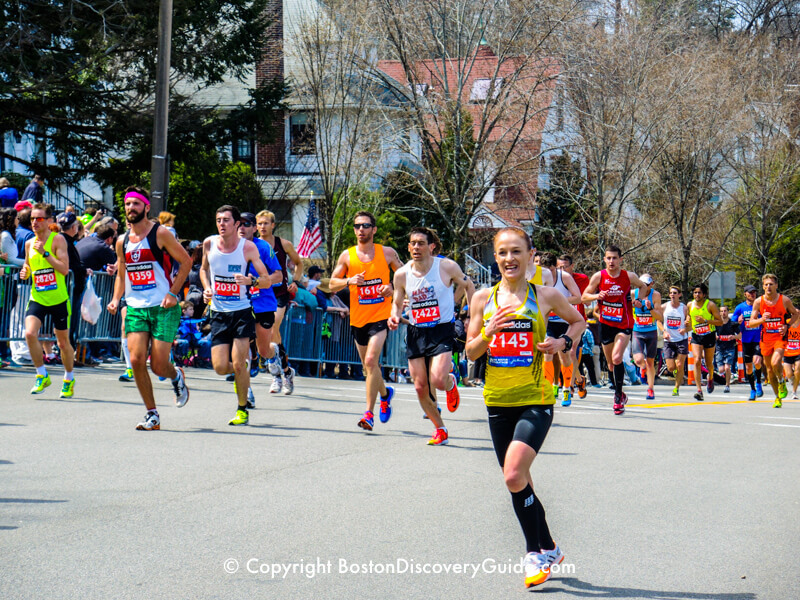 Marathon, Patriots Day, Red Sox - Biggest April Events! 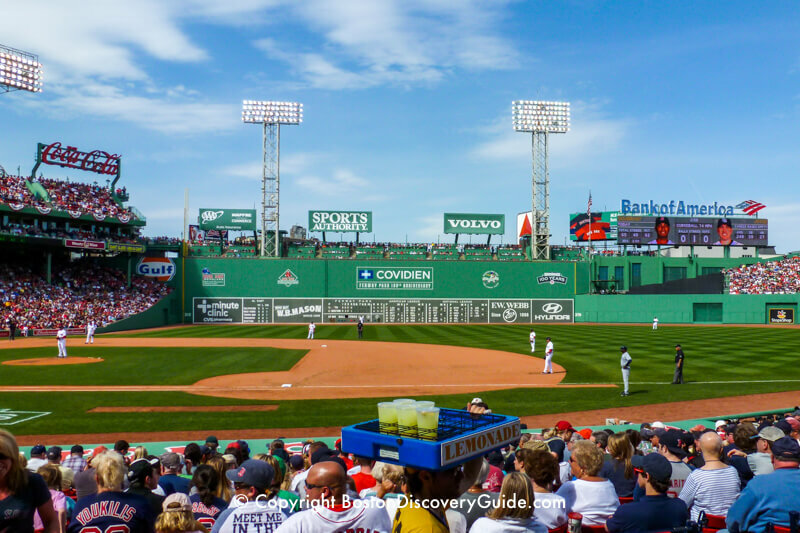 Exciting events fill the Boston Events Calendar for April, 2019 - the 122nd Boston Marathon, Patriots' Day reenactments, Red Sox opening day, and more! Large crowds will cheer the Boston Marathon runners as we express support for this important Patriots Day event and its meaning to our city. 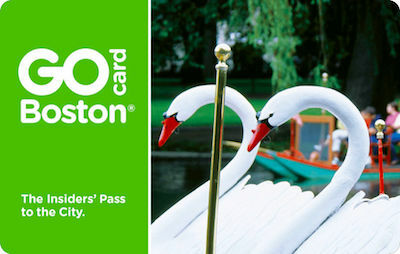 It's the perfect time to visit Boston. 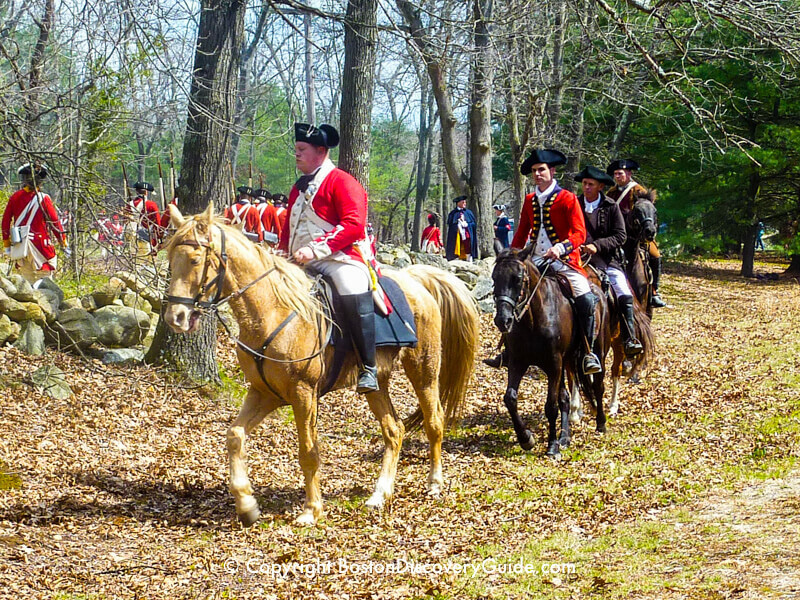 Patriots' Day commemorates the start of the American Revolution with numerous reenactments, parades, and celebrations. Don't miss the chance to experience this local tradition in which local citizens honor those who paved the way for freedom from British rule almost 250 years ago. Concerts and theaters feature great lineups this month with Fleetwood Mac, Les Miserables, and more. With warmer weather finally here, restaurants set up their outdoor seating for al fresco dining. 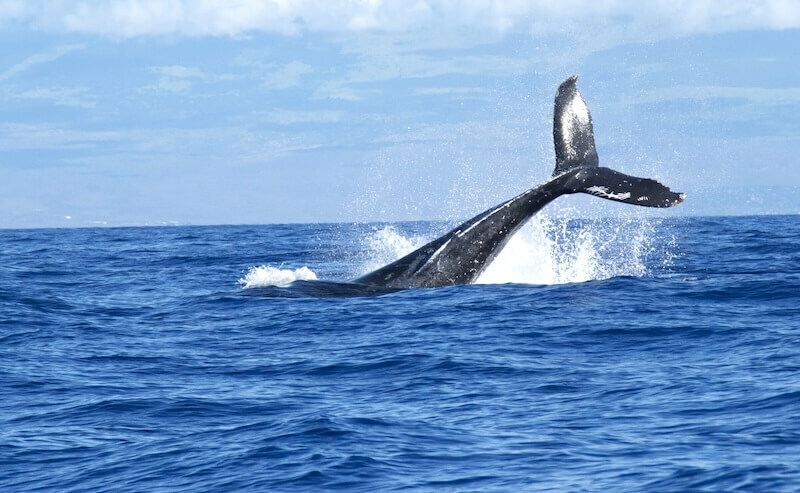 Check out all our top recommendations for fun things to do in Boston in April - and start planning your visit now! 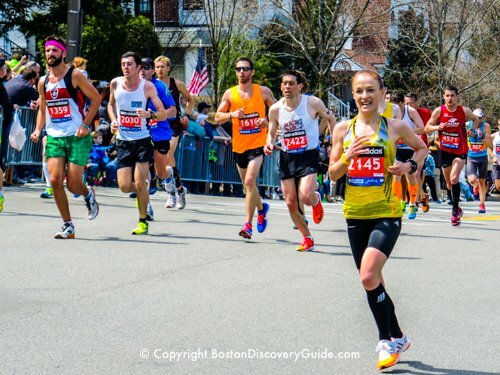 The Boston Marathon - one of the city's biggest events of the year, and also known as the "Patriots Day Race" - features about 36,000 elite runners from around the world competing in a route made difficult by rolling terrain and features such as "Heartbreak Hill." Although the winners complete the course in just over 2 hours, many participants are still running hours later. You can watch from anywhere along the route. If you attend the traditional Boston Red Sox home game at Fenway Park scheduled for Marathon Day, you'll be part of the crowd streaming into Kenmore Square just as the runners arrive at the finish line on Boylston Street. Celebrated annually on the third Monday in April (a Massachusetts State holiday), Patriot's Day (April 15, 2019) commemorates events and battles in Lexington, Lincoln, Concord, and present-day Arlington (once called Menotomy) that marked the beginning of the Revolutionary War. 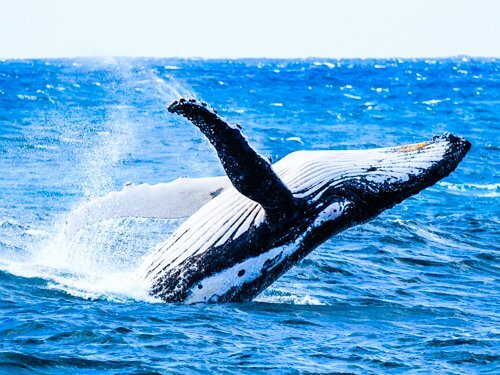 Immerse yourself in fun science adventures for 10 days in the kids-and-adults-friendly Cambridge Science Fest at multiple Boston and Cambridge locations. A robot zoo, scavenger hunts, urban cycling workshops, bacterial "forests," virtual reality - these are just a few of the things you can explore. 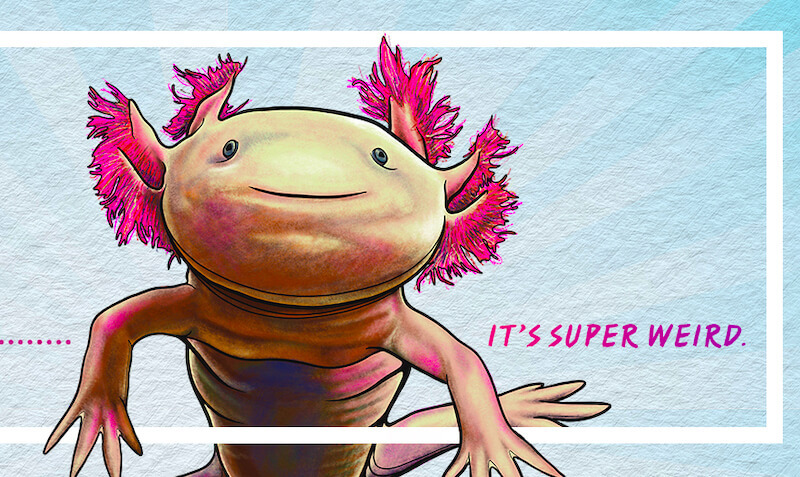 Find the complete schedule on the Science Fest's website. Most events are free. The Red Sox play their home field season opener at Fenway Park in early April each year. This year, their opening game is against the Toronto on April 9. Then, based on tradition, the Sox play a home game on Patriots Day and the game ends just in time for fans to watch Boston Marathon runners rush past Fenway Park on their way to the finish line. Top April shows include Fleetwood Mac and Cher at TD Garden, Amanda Palmer at the Orpheum Theatre, Billy Idol & Steve Stevens @ Lynn Memorial Auditorium, and famed violinist Itzhak Perlman at Boston Symphony Hall. 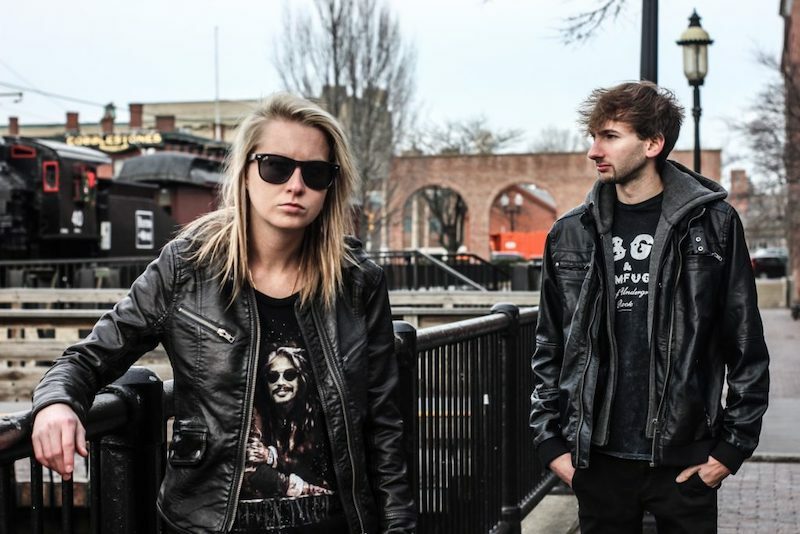 Twenty four mostly-local bands will play at Rock & Roll Rumble held at Once in Somerville during the first three weekends in April, carrying on an annual tradition dating back to 1979 at the legendary Rat in Kenmore Square. Tickets are cheap - $10 online in advance, $15 at the door. Popular bands that have played here through the years include Dresden Dolls, Morphine, The Lemonheads, The Gravel Pit, and Letters to Cleo. All bands are paid and the best win prizes - but even more important, it's your chance to hear the top bands of tomorrow. Check the event's website for dates, times, lineups, and directions. 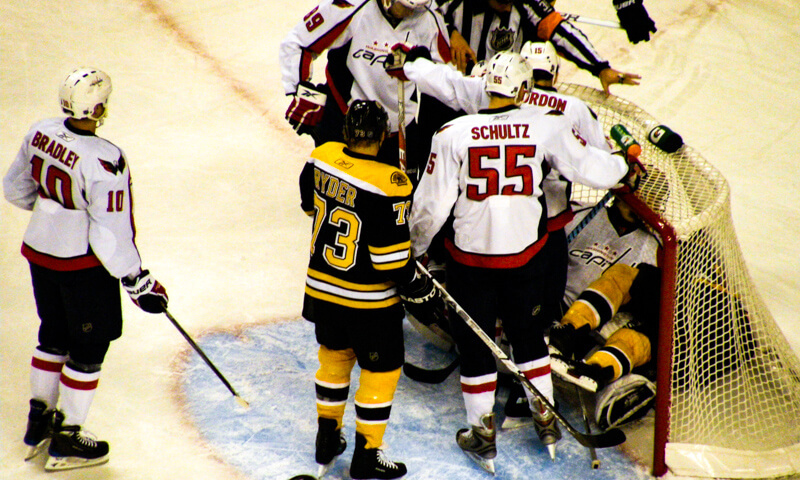 Get your Boston Bruins tickets for April home games at TD Garden before the regular season wraps up. 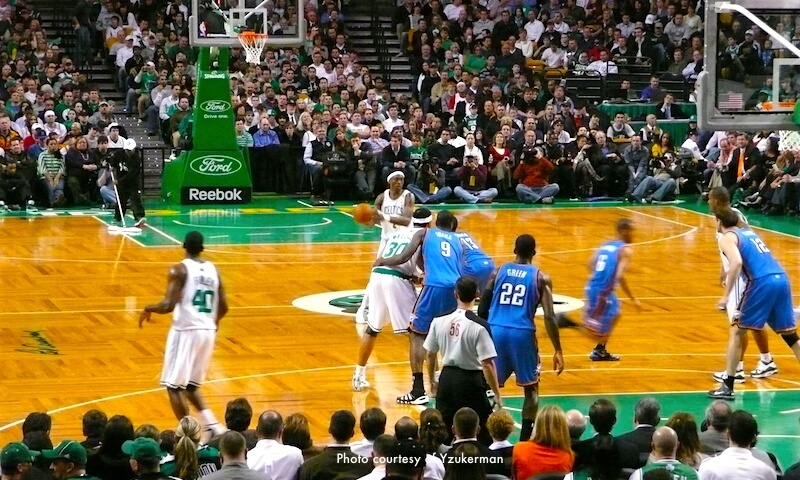 The Celtics play their last regularly scheduled home games of the season at the Garden. Will they head into the NBA Eastern Conference First Round this year? Too soon to tell, but stay tuned. 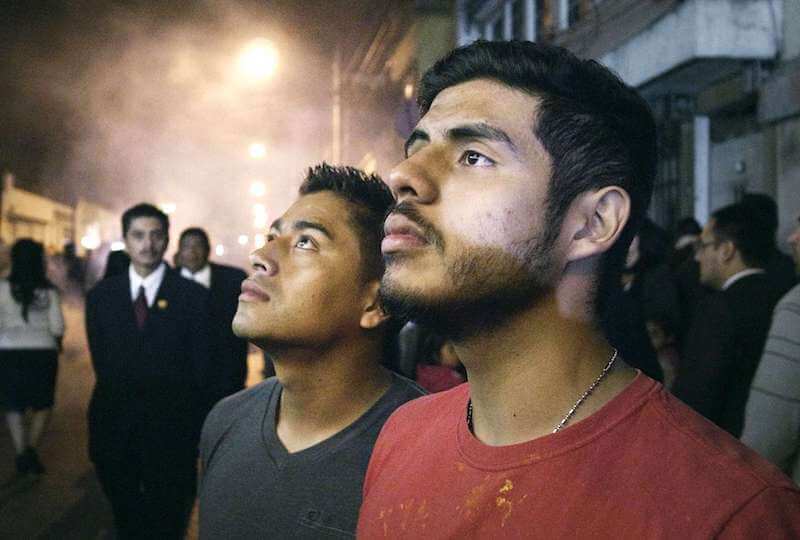 The Boston International Film Series brings together the best local and international independent and experimental films in this annual festival. "Eclectic" barely begins to described the wide-ranging scope of the films you'll see here - everything from documentaries to avant-garde surrealism. Tickets are sold for "sessions," typically including a longer film bundled with several shorter films on a similar topic or theme. 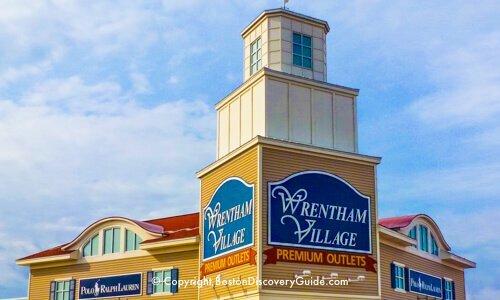 A superb Financial District location close to Faneuil Marketplace, top visitor sites such as the historic Freedom Trail, and the Waterfront, Hyatt Centric Faneuil Market is ideally situated for both business and leisure travelers. 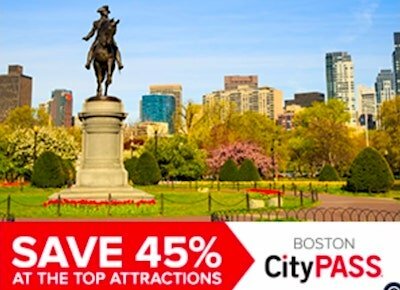 You're about 8-10 minutes on foot from TD Garden, plus several nearby T (subway) stations put the rest of the city within easy reach - and now that balmy April weather has arrived, you'll love how many attractions are within a quick walk from the Hyatt Centric. 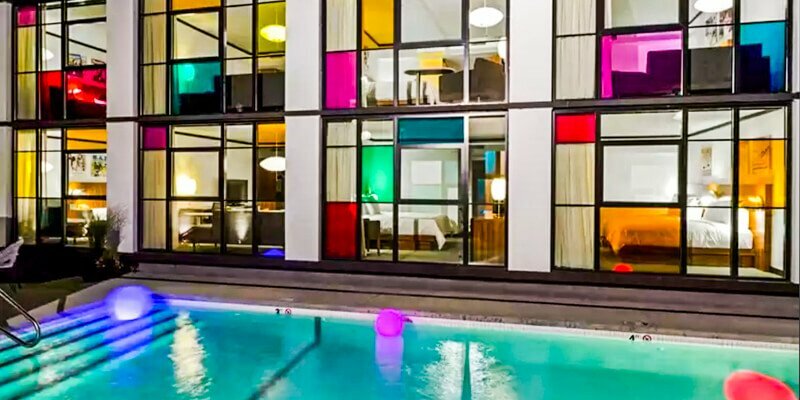 The 163 guestrooms and suites offer free wifi, smart TVs, bluetooth speakers, robes and slippers, and all the other amenities you'd expect in a high-end hotel. Dine onsite at Bar Mercato and enjoy its small plates and relaxed ambiance, or eat at any of the other excellent choices nearby. 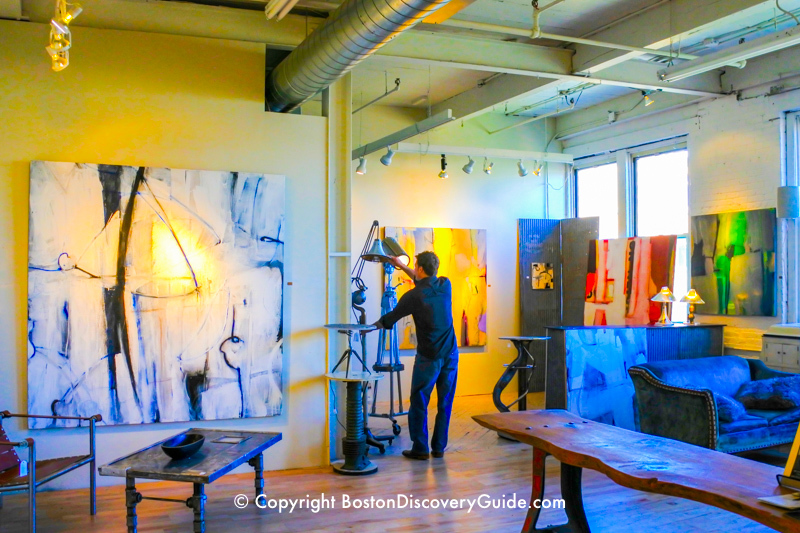 Where: Boston's South End; Open studios are at 46 Waltham Street, 35 Wareham Street, 49 Wareham Street, 59 Wareham Street, 450 Harrison Ave and the Artist Studio Building at BCA, 551 Tremont Street. 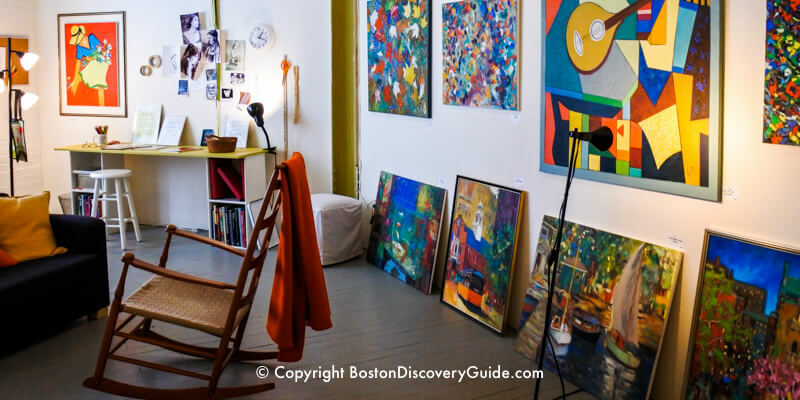 USEA Artists in Their Studios lets you meet the USEA artists and get behind-the-scenes tours of their studios on this self-guided tour of the South End neighborhood. What to look for: Everything, including photography, painting, printmaking, mixed-media, sculpture, jewelry, illustration, and more. 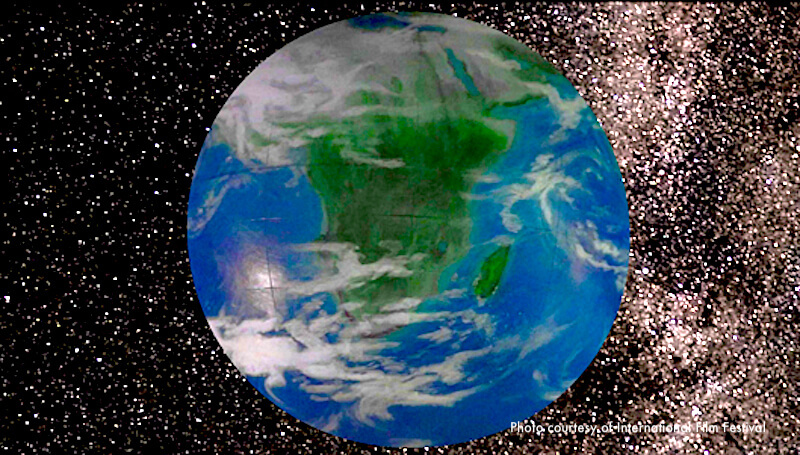 Getting around: Pick up a free map at the information tables at Boston Center for the Arts (551 Tremont Street) and at 450 Harrison Ave.
Tickets: Buy season passes (partially tax deductible) or individual tickets - see IFF's website for pricing. The Independent Film Festival Boston spans 8 days, and promises to be bigger and better than ever, with familiar names plus many new ones. IFF Boston showcases independent film makers from around the world working outside of the Hollywood system, and the lineup offers plenty of interesting features, shorts, and documentaries. Lots of panels and parties let you can talk with the filmmakers and ask them questions. Boston film fanatics rate this festival as one of the best. The huge (and free) John Hancock Sports and Fitness Expo and Number Pick-Up takes place in the Seaport World Trade Center (200 Seaport Ave) prior to the race during Marathon Weekend - April 13-15 - and if you love running, you couldn't ask for a better reason to arrive a few days early before the race. Runner's World magazine calls this event the "best runner's expo in the country" and the 100,000 enthusiasts in attendance can attest to that. 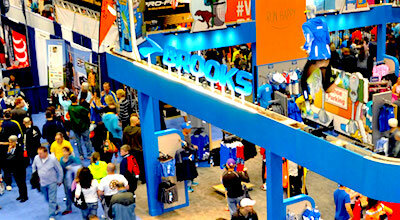 In addition to the popular Runners Seminar Series, you can visit exhibits by 200 of the running industry's top companies - and of course you can buy every bit of running gear you've ever dreamed of. Race participants pick up their bib number here as well. 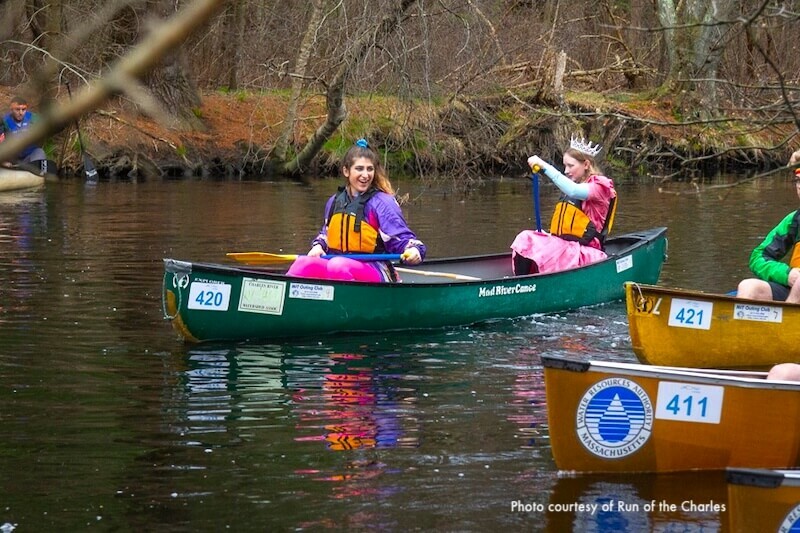 Run of the Charles, New England's largest canoe and kayak race, takes place on the last Sunday in April - perfect way to spend a Saturday afternoon if you're a spectactor, or enjoy a day on the river if you're a paddler. About 1,500 racers and spectators participate each year. Don't miss the River Festival beginning at 11:30 at the finish line with live music, a taco truck, raffles, a beer garden, and vendors! On April 5 as well as on other SoWa First Fridays in Boston's art-filled South End, over 60 galleries south of Washington Street and at the Artist's Guild at 450 Harrison Ave, and nearby businesses and restaurants open their doors from 5pm to 9pm to give you a chance to experience the vibrant South End arts community. 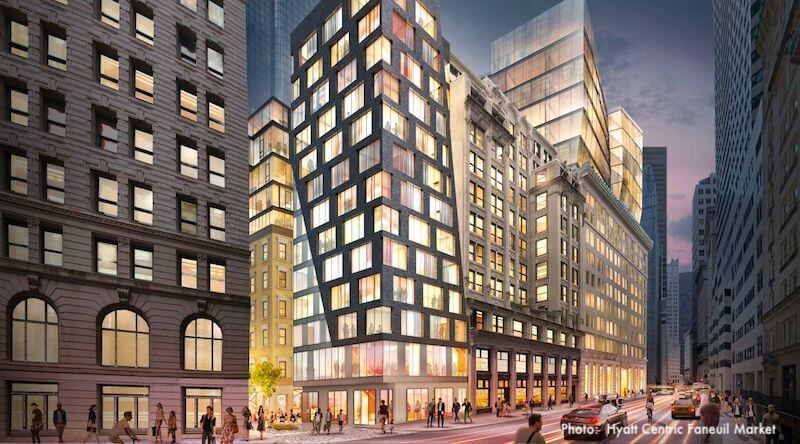 Start at 450 Harrison, and just follow the gallery lights and signs as you stroll around the neighborhood. Wrap up your evening at one of the South End's renowned restaurants. 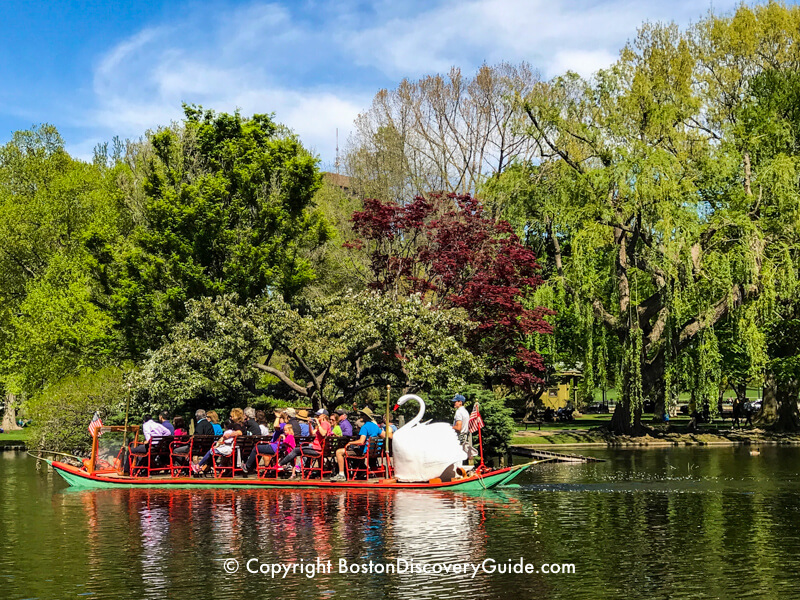 In a sure sign that spring has arrived, the pedal-powered Swan Boats return to the Lagoon in Boston's Public Garden every April on the Saturday before Patriots Day. Welcome spring and enjoy the pale green hints of spring foliage as your boat glides around the Lagoon for the blissful 15-minute ride. Soon, the real swans will return. While you're in the Public Garden, walk over to see the famous Make Way for Ducklings statues. The colorful Boston Common carousel across from Beacon Street provides plenty of entertainment for the younger set from April through October. 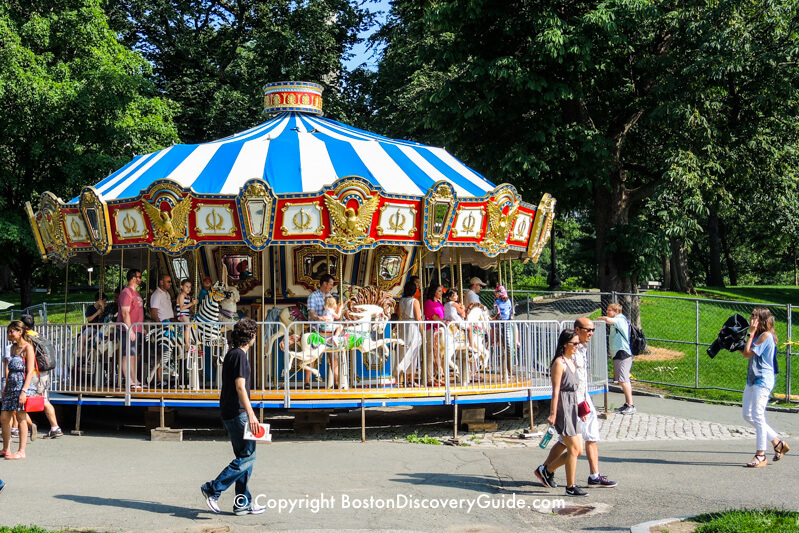 Check out Boston's other carousel located on the Rose Kennedy Greenway. This year's Japan Festival takes place on Saturday, April 27 and Sunday, April 28 (11am-5pm) on Boston Common. 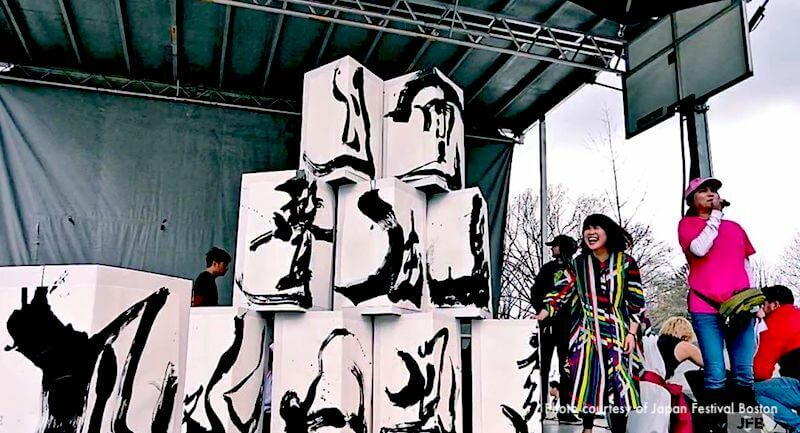 The festival celebrates Japanese culture in Boston with performances on two stages, Japanese athletes and singers, cosplay contest, workshops, food vendors, raffles, silent auctions, and 100+ booths with food, arts, and crafts. Look for the traditional Japanese portable shrines, including children's versions, brought to the site by volunteeers in the spirit of Japanese festivals. This has grown into a huge event, with 60,000 attendees last year and probably more this year. Cost: Tours and most special events are free with the cost of museum admission, while the teas and a few other events require tickets - check the MFA website for details. 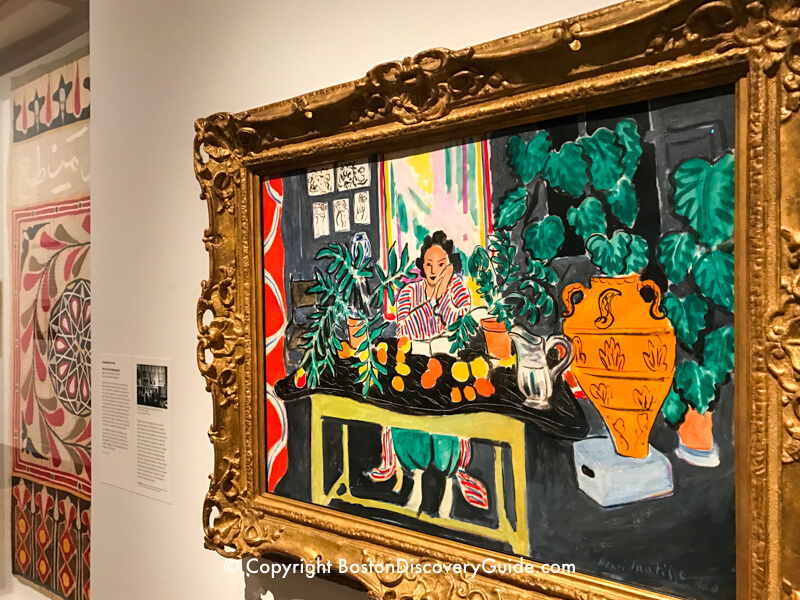 Art in Bloom at MFA welcomes the arrival of spring in Boston with floral arrangements inspired by works of art throughout the museum, flower arranging demonstrations, outdoor walking tours, and informal dining among European paintings at the Art in Bloom Café. And of course, the timing of MFA's event is perfect: outside the museum, magnolia and cherry trees have burst into bloom all over Boston. Celebrate this special time of the year by visiting Art in Bloom - and then walk around the city and enjoy all the flowers. 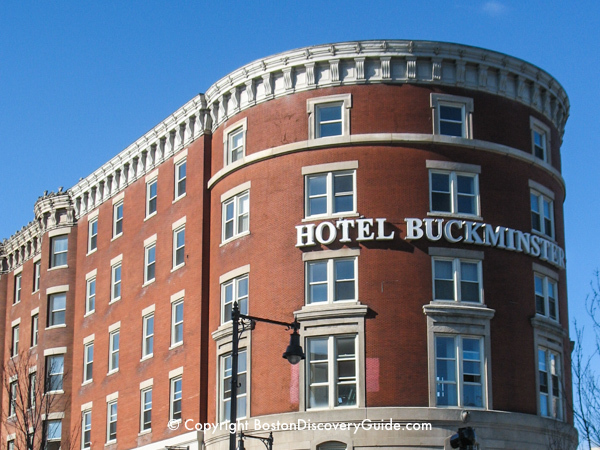 Although Faneuil Marketplace's famous street performers entertain fans throughout the year, the return of balmier weather during April make this the perfect month to catch a show. Performances take place throughout the day (with most between about 11am-4pm) and vary daily, but you can usually expect to see stunts, musical acts, magicians, and acrobats doing balance routines. 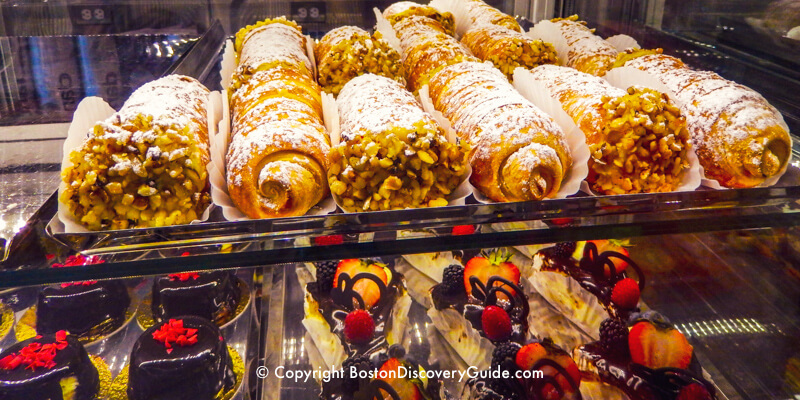 Taste of the North End on Friday, April 26, 7pm-11pm gives you a great chance to sample special dishes from over 45 North End restaurants, bakeries, and distributors in this annual tasting event. This is also the North End's biggest fundraiser - proceeds benefit the North End Waterfront Health Center, as well as other neighborhood charities for children and seniors. The list of participating restaurants is too long to name . . . but just to whet your appetite, look for treats from Carmelina's, Castle Island Brewing Co, Mamma Maria, Bricco, Taranta, Artu, Lucca, Massimino, Neptune Oyster, and Modern Pastry, as well as liquid refreshments from a number of neighborhood wine importers. With panoramic waterfront views to enjoy from the Steriti Rink, this is sure to be a spectacular evening. Boston bursts into bloom in April, making it the perfect time to explore the city! 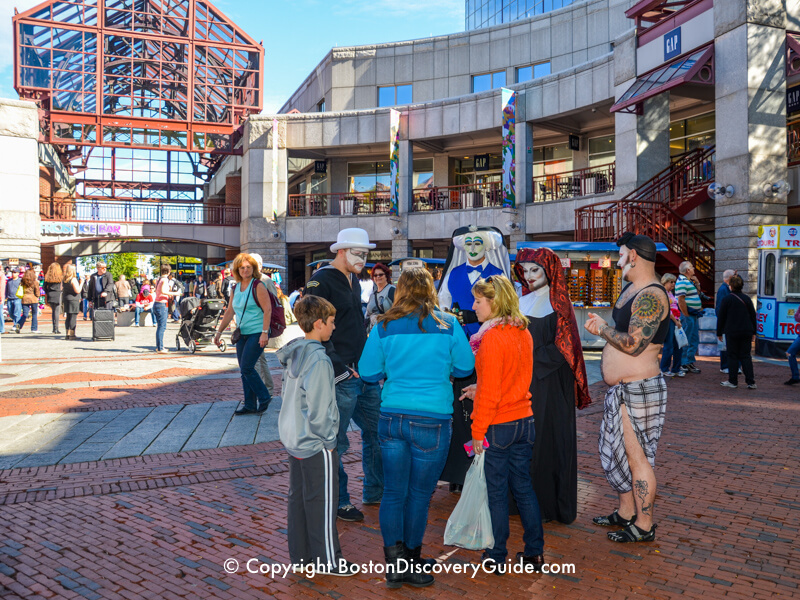 These fun trolley tours, bus tours, and special destinations let you enjoy Boston at its best!